Luxury watches from Zenith represent precision, quality, and reliability. The El Primero was the first automatic chronograph caliber developed in the world. Its 2017 successor can measure 1/100th of a second. 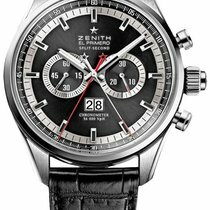 The Swiss luxury watch manufacturer Zenith is inseparable from their famous chronograph caliber, the El Primero. This movement was released as 3019 PHC in 1969 and was the first automatic chronograph movement ever produced. Thanks to a balance frequency of 36,000 A/h, it can measure 1/10th of a second. Most chronographs can only measure 1/8th of a second, as they oscillate at 28,800 A/h. In 2017, the company presented the ultra-modern Zenith El Primero 21 caliber. The successor to the famous El Primero has two escapements, one for displaying the time and the other for chronograph functions. One oscillation system vibrates at 360,000 A/h, allowing it to measure 1/100th of a second, while the other vibrates at 36,000 A/h. Haute horlogerie highlights from Zenith include the intricate watches in the Academy Christophe Colomb (French for Christopher Columbus) series. The model Zenith Academy Christophe Colomb Equation of Time is a true example of 21st-century watchmaking art. This timepiece won the Best Complicated Watch Prize at the Grand Prix d'Horlogerie de Genève in 2011, one of the most prestigious awards in the world of mechanical watches. Zenith even developed a self-regulating mechanism for this ultra-precise watch, the so-called Gravity Control module. It ensures that the escapement and oscillation systems constantly remain in a horizontal position, regardless of the position of the watch on a wrist. This pioneering system guarantees optimal precision. How much does a Zenith watch cost? Zenith is a part of the luxury goods concern LVMH Moët Hennessy - Louis Vuitton SE (LVMH), nestled in between TAG Heuer and Hublot. Zenith watches are meant for the young at heart who have an appreciation for tradition, high-quality in-house work, and innovative technology. Movements developed and produced in-house are even featured in some of the Elite collection's introductory models. These women's and men's watches have predominantly classic designs, making them ideal dress watches. Zenith offers high-quality luxury watches that are comparatively affordable. Jean-Claude Biver, the head of LVMH, was instrumental in this strategy of offering affordable luxury watches. You can find a number of good deals in the vintage market. There are countless pre-owned Zenith wristwatches and pocket watches which you can purchase for just a few hundred euros. Even chronographs with the famous El Primero movement are available pre-owned starting at 1,700 euros. These are often from the 1990s and are in very good or good condition. You should plan on spending at least 3,300 euros for a new model. The El Primero is, without a doubt, one of the most famous and best chronograph movements worldwide. Therefore, it's not a surprise that manufacturers other than Zenith utilize this movement in their timepieces. Even Rolex used a heavily modified El Primero known as the 4030 from 1988 to 2000 in their Daytona watches. TAG Heuer also uses this high-frequency movement in their Carrera Calibre 36, albeit a modified version. The origins of the classic caliber reach all the way back to 1969 when Zenith, Seiko, and a cooperative alliance between Breitling, Heuer, and Büren raced to be the first to make an automatic chronograph caliber. This race brought the Swiss manufacturer Zenith into the spotlight. Models with an El Primero from 1969 are comparatively rare today and not as expensive as one might think. Depending on its condition, you can purchase such a timepiece for around 5,000 euros. Yellow gold models in very good condition can cost over 10,000 euros, which is still comparatively inexpensive. For comparison, a Rolex Daytona from 1969 can cost over 180,000 euros. Pre-owned models from the 1980s and 90s are especially affordable. Prices for these El Primero watches start around 2,000 euros. Models from the 1970s only cost a few hundred euros more. The current collection features a 38-mm watch (03.2150.400/26.C714) which closely resembles the original model from 1969. New, the stainless steel model costs around 5,100 euros. If you prefer a 42-mm case, then the Chronomaster El Primero 42 is a good choice. Like the 38-mm model, it's available in stainless steel, rose gold, or bicolor rose gold/stainless steel. Stainless steel versions (03.2040.400/69.C494) cost around 5,000 euros. If you want a 42-mm gold watch to call your own, then you should be prepared to spend around 11,000 euros. The model with reference number 24.2041.400/21.R576 stands out due to its ceramicized aluminum case. This material is made of aluminum, the surface of which is converted into oxide ceramic via a special oxidation process. After the procedure, the watch case is hard, scratch-resistant, corrosion-resistant, and lightweight. You will need to spend at least 6,600 euros on this timepiece. Highlights from Zenith include their gold watches with an El Primero tourbillon movement. These luxury watches cost around 55,000 euros new. With a stainless steel case, they cost around 10,000 euros less. In very good condition, a pre-owned rose gold variant with a tourbillion costs around 30,000 euros. Even more exclusive is the Zenith Chronomaster El Primero Tourbillon GFJ, which utilizes a fusée-and-chain transmission. This mechanism is rarely used. Unlike the more common systems, a fusée-and-chain transmission ensures the movement has a constant driving force. A new, gold Chronometer El Primero Tourbillon GFJ (18.2520.4805/98.C713) costs more than 70,000 euros. 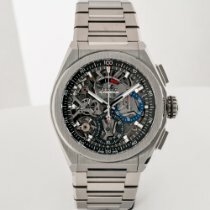 Completely skeletonized watches with El Primero movements are also highlights from this company. The Le Locle-based manufacturer uses "Full Open" as an affix to the name in order to emphasize the skeletonizd design. Thanks to the skeletonized dial, you can view the movement from the front side of the watch, too. A sapphire glass case back gives you a clear look at the beating heart of the timepiece. New bicolor variants (51.2081.400/78.C810) cost about 7,000 euros. Zenith presented the Defy El Primero 21 at Baselworld 2017, one of the most important watch trade shows in the world. This wristwatch is powered by a successor to the El Primero chronograph caliber and catapulted the brand into the 21st century. The movement has two separate, independent escapements. The first ticks at 36,000 A/h and ensures the time is displayed. The second oscillates at 360,000 A/h (50 Hz), enabling the watch to measure 1/100th of a second. Currently, the Defy El Primero 21 is available with a ceramic or titanium case. The titanium version is available with a skeletonized dial or in a retro design with a silver dial and black numerals. 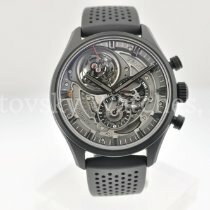 Prices for this titanium watch start at 7,200 euros. The skeletonzied titanium and ceramic watches cost around 8,500 euros. Although wristwatches with the El Primero caliber are Zenith's most famous timepieces, the Swiss manufacturer has other beloved series, such as the Pilot collection. It consists of classic pilot's watches, as Zenith has a longstanding relationship with aviation. During the early years of flying, they were supplying pilots and airplanes with their timepieces. The Type 20 Extra Special is reminiscent of historical models from the 1940s with its retro design. Its large case, hands, numerals, and oversized onion crown (which can be used with gloves on) are all distinctive features. The Pilot Type 20 Skeleton and Pilot Type 20 Hommage à Louis Blériot are especially rare models. Both were limited to five pieces each and cost 205,000 euros. Watches produced in larger numbers are significantly more affordable. A bronze watch with three hands (29.2430.679/21.C753) costs around 5,000 euros. As a new chronograph, the 45-mm pilot's watch costs around 6,000 euros. If you're not a fan of bronze, there are many stainless steel options. These watches feature artificially aged cases, giving them vintage charm. The variant with three hands costs 5,000 euros, while the chronograph costs 5,500 euros. The Zenith Elite series was introduced to the market in 1994, when mechanical watches were gaining in popularity. These elegant wristwatches are powered by ultra-thin automatic movements with long-lasting power reserves. In 1994, the Elite caliber was only 3.3 mm thick and could run for 55 hours uninterrupted. Pre-owned models from the 1990s only cost around 1,000 euros, and newer versions in very good condition cost a bit more at 1,600 euros. The price for new watches starts at around 2,700 euros. Top models made of 18-karat rose gold and featuring a tourbillon cost over 50,000 euros. If you don't necessarily need a tourbillon, you should plan on spending around 16,000 euros for a new gold watch with a matching gold bracelet. With a leather strap, a gold Zenith Elite only costs 9,000 euros. Zenith has over 150 years of watchmaking experience and history. Watchmaker Georges Favre-Jacot founded his company in 1865 in Le Locle. According to legend, Favre-Jacot named the company "Zenith" after creating a watch of extraordinary quality. A five-pointed star serves as the company's logo; together, the name and logo symbolize the manufacturer's aspiration to create timepieces of the highest quality. In the early years, Favre-Jacot focused on the production of pocket watches. He brought all of the important players in watchmaking together in his company to achieve independence from third-party suppliers. From the very beginning, the manufacturer was producing incredibly precise timepieces, which later competed in the Neuchâtel Observatory's chronometer competition and won multiple times starting in 1903. Favre-Jacot left the company in 1911 and left it in the hands of his nephew, James Favre. Zenith has belonged to the luxury goods concern LVMH since 2000. In addition to pocket watches, Zenith also produced countless deck clocks. At the beginning of the 20th century, they introduced one of the first wristwatches with an alarm function. Around this time, easily readable pilot's watches were also being developed and used in the First World War. Chronographs have been a part of this manufacturer's repertoire for about a century. Still today, the El Primero caliber is Zenith's most famous product. It was the first automatic chronograph in the world and has been reliably and precisely keeping time since 1969.